What does your site look like on an iPad or iPhone? Google’s share price crash last week made headlines, and many people advertising with the search engine who read deeper into the story will have been puzzled by the analysts’ suggestion that one of the reasons for the reduced profitability was a drop in “cost-per-click”. You wouldn’t think that’s the case if you’re a B2B company in the UK, where cost-per-click has been rising inexorably for several years. Top-of-page clicks which now cost us £2 might have cost as little as 50p three years ago. So what’s going on? The explanation appears to be the rise of mobile advertising. Overall, one in five search advertisement clicks are predicted to be from mobile devices by the end of this year, and clicks from mobile devices are cheaper, presumably because they’re valued less highly by many advertisers. Of course (as you’ll be able to see from your website analytics application), companies primarily in the B2B sector won’t receive anything like that much mobile traffic. So – sadly – it’s unlikely that most of us will be enjoying a holiday from the rise in cost-per-click levels. 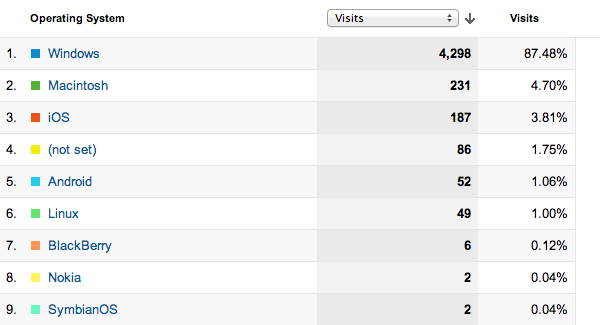 However, it is worth keeping an eye on the number of visits from mobile devices (above). Even for some bread-and-butter component manufacturers, 5% is quite typical. And that’s a lot of business. What does your site look like on an iPad or iPhone?